Somewhat confusingly, the America story began in London in 1971. That’s when high school students Dewey Bunnell, Dan Peek, and Gerry Beckley first met. Their fathers were all members of the US Air Force, and at that time, were stationed in London. Far from home, and strangers in a foreign country Dewey, Dan and Gerry soon became close friends. They had a lot common. Especially music. It wasn’t long until Dewey, Dan and Gerry formed a group. They sung close vocal harmonies and quickly, honed their own sound. Early on, it was described as acoustic folk. This became popular around the London area, where they performed live. For the trio of high school students, things were happening fast. By the time that Dewey, Dan and Gerry had graduated high school, Warner Bros. offered them a record band. For the nascent group, this was the stuff that dreams were made of. However, for America this was just the start of a roller coaster ride. Between 1971 and 1976, America became one of the most popular bands on both sides of the Atlantic. They released six albums during this period, and they feature in the The Warner Bros. Years 1971-1977 box set. It was recently released by Warner Bros. and celebrates the most successful period of America’s career. This began in December 1971, when America released their eponymous debut album. Having signed to Warner Bros., the label didn’t waste time getting their latest signing into the studio. 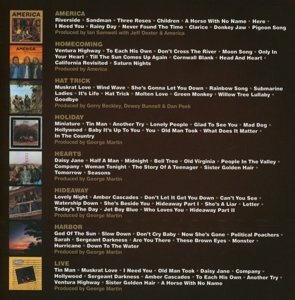 America had written twelve tracks for their eponymous debut album. Each member contributed to the America. Dewey Bunnell penned six tracks, Dan Peek three and Gerry Beckley three. These songs were recorded at two London studios. Trident Studios and Morgan Studios were chosen for the recording of America. Producing America, was Ian Samwell, who already established a reputation as a talented producer. Keeping a close eye on proceeding was former dancer Jeff Dexter. He was America’s manager, and was credited as the executive producer of America. His clients were a talented trio. This became apparent when recording of America began. The three members of America were all multi-instrumentalists. They played many of the instruments on America. Dewey Bunnell played acoustic guitar. Gerry Beckley played bass, six and twelve string acoustic guitar, electric guitar, piano and chimes. Dan Peek bass, six and twelve string acoustic guitar, electric guitar and piano, When it came to the lead vocals, they were shared around. Usually, one member of America took the lead, while the other two added harmonies. However, on Riverside which opened America, the three members of America shared lead vocals. Augmenting America, were some session players including guitarist David Lindley and percussionist Ray Cooper. Once America was recorded, it was scheduled for release in December 1971. Before the release of America, critics received an advance copy. When critics heard this new group’s debut album, they were quickly won over. While critical acclaim accompanied the release of America, some critics went as far as to call the album a “folk pop classic.” This was a huge call, but proved to be prescient. When America was released on 29th December 1971, the album began climbing the charts on both sides of the Atlantic. In Britain, America’s adopted home, the album reached number five and was certified silver. However, in their home country, America reached number one in the US Billboard 200, and was certified platinum. Helping sales of the album were a classic single. A Horse With No Name was chosen as the lead single from America. It was released on January 12th 1972, and reached number three in Britain and number one on the US Billboard 100. Elsewhere, A Horse With No Name was a huge hit single. However, it was in America where it was most successful. Having sold over a million copies, A Horse With No Name was certified platinum. For America, this wasn’t the end of the success. I Need You was released on 26th April 1971, and reached number nine in the US Billboard 100. This was just the icing on the cake for America. They had just enjoyed a million selling single and album, both of which were being referred to as classics. Could things get any better? After the success of America, the band returned to the studio in 1972. The pressure was on for America to prove that their debut album hadn’t been a fluke. Musical history was littered with bands who enjoyed one successful album, then faded away. America were determined not to join their ranks. For their sophomore album Homecoming, the three members of America penned nine of the ten tracks. Each member contributed three tracks each. America the band, were a democracy. The other track on Homecoming was a cover of John Martyn’s Head and Heart. With the help of some top session players, these tracks became America’s sophomore album. Among the session players, were Wrecking Crew drummer Hal Blaine. He provided the heartbeat to nine of the tracks on Homecoming, which was being produced by America. For such a young group, this was seen as a brave or foolish decision. Ironically, when critics heard Homecoming there was no criticism of the production. America’s decision to dispense with a producer had been vindicated. The only criticism of Homecoming was that some of the lyrics lacked depth. They veer towards banal, and can hardly be described as cerebral. Despite this, Homecoming received glowing reviews, and nowadays, is seen as one of their finest albums. Record buyers heard a sneak preview of Homecoming on September 19th 1972. That’s when Ventura Highway was released as a single. It reached number forty-three in Britain and number eight in the US Billboard 100. This augured well for the release of Homecoming. November 15th 1972 was the date that America had been waiting for. That was when their sophomore album was released. It was their production debut. They wondered how listeners would react to the change in sound. Although still based around the acoustic guitar, both the electric guitar and keyboards were more prominent. America hoped this stylistic departure wouldn’t alienate listeners. It didn’t. Homecoming reached number twenty-one in Britain and number nine in the US Billboard 200. While Homecoming wasn’t as successful as America, the album was certified platinum in America. This was America’s second album that sold over a million copies. Elsewhere, America’s popularity was spreading. Homecoming was certified platinum in Australia and gold in Canada. Spurred on by this success, America released another single from Homecoming. Don’t Cross the River was released on the 3rd January 1973, and reached number thirty-five in the US Billboard 100. This was disappointing for America. It was the least successful single of their career. Until America released Only in Your Heart. When it was released on April 14th 1973, it stalled at a lowly sixty-two in the US Billboard 100. Were there problems ahead for America? Although Homecoming had been certified platinum, the commercial failure Don’t Cross the River and Only in Your Heart rankled with America. This made them doubly determined to return with another successful album. So they began work on their third album. Eventually, Dewey Bunnell had penned four tracks, Gerry Beckley three and Dan Peek two. The three members of America penned Hat Trick, which lent its title to the album. Muskrat Love was the other song on Hat Trick. It had been penned by Willis Alan Ramsey. Originally, the song had been entitled Muskrat Candlelight, and featured on Willis Alan Ramsey’s 1972 eponymous debut album. However, when America recorded the song, they changed the title to Muskrat Love. Along with the other ten tracks, it was record at the Record Plant, Los Angeles. Just like Homecoming, Hat Trick was produced by America. They brought onboard some high profile musicians to augment them. Drummer Hal Blaine, guitarist Joe Walsh and Beach Boys Bruce Johnston and Carl Wilson. They joined America as they recorded Hat Trick between 29th May and 12th July 1973. Once Hat Trick was recorded, the release was scheduled for October 19th 1973. Before the release of Hat Trick, critics had their say. They weren’t impressed. The songwriting wasn’t on Hat Trick wasn’t the standard. Letting Hat Trick down were Green Monkey, Molten Love and Willow Tree Lullaby. These three tracks weren’t up to the standard critics expected of America. Nor were some of the tracks as melodic as America and Hat Trick. America seemed to have lost their folk rock mojo. Would this be reflected in sales of Hat Trick? Muskrat Love had been released as a single on June 28th 1973, while America were still recording Hat Trick. It stalled at a disappointing sixty-seven in the US Billboard 100. When Hat Trick was released on October 19th 1973, it reached just forty-one in Britain and twenty-eight in the US Billboard 200. There was no third platinum disc for America. A small crumb of comfort was that Hat Trick was certified silver in Britain. That was as good as Hat Trick got for America. When Rainbow Song was released later in 1973, it failed to chart. Green Monkey also failed to chart upon its release in 1974. For America, these were worrying times. Following the relative failure of Hat Trick in America, America decided to bring onboard a producer. With technology playing an increasingly important part in the recording process, many thought that America would employ someone used to the latest technological advancements. Instead, they brought onboard someone who many regarded as an old school producer. However, forty-eight year old George Martin had an enviable track record. He was the man who transformed the fortunes of The Beatles, taking them from relative unknowns to the biggest selling band in the world. If he could work his magic again, America’s career would be back on track. For the first album in America’s George Martin era, America had written twelve tracks. Gerry Beckley had penned five tracks, Dewey Bunnell three and Dan Peek three. Dan also penned Lonely People with his wife Catherine Peek. These twelve tracks would accompany America to AIR Studios, London. Recording of what became Holiday, began on April 17th and was completed on May 7th 1974. America played every instrument, apart from the drums. Willie Leacox was drafted in to add drums. Geoff Emerick engineered Holidays and George Martin arranged and produced the album. George Martin even added some keyboard tracks. Everything went smoothly, and in three weeks America’s fourth album Holiday was complete. Would it be their comeback album? Critics decided that it was. America’s decision to bring George Martin onboard was a masterstroke. He brought out the group’s potential. For much of Hat Trick, it seemed to have lain dormant. Not any more. George Martin brought out the best in America, and the result was Holiday, an album that would appeal to a wide spectrum of record buyers. Whether AOR, folk rock, pop or rock was their bag, record record buyers were won over by Holiday. It reached number three in the US Billboard 200 and number one on the Adult Contemporary charts. Holiday was certified gold in America and silver in Britain. America’s comeback was almost complete. Tin Man was chosen as the lead single from Holidays. It was released on July 10th 1974, and reached number four in the US Billboard 100 and number one on the Adult Contemporary charts. Lonely People was released as a single on November 27th 1974, and reached number five in the US Billboard 100 and number one on the Adult Contemporary charts. Now America’s comeback was complete. Following the success of Holiday, America were under pressure to record their fifth studio album. Less than two months after the release of Holiday, America were back in the studio with George Martin. For Hearts, America had written twelve new tracks. Garry Beckley wrote just three tracks and Dewey Bunnell three. However, Dewey cowrote Dan Peek penned Midnight and The Story Of A Teenager. Dan Peek contributed three tracks, and cowrote Old Virginia with Catherine Peek. These twelve tracks wouldn’t be recorded in America with George Martin. This time, George Martin decided to forsake his beloved AIR Studios for the sun of Sausalito, in California. That’s where The Record Plant was situated. It had quickly established a reputation as one of the top studios on the West Coast. The sessions began on January 6th 1975. George Martin arranged and produced Hearts. He even added piano. Engineer Geoff Emerick accompanied George Martin. Another familiar face was drummer and percussionist Willie Leacox. He had featured on Holiday. A newcomer was bassist David Dickey. Hearts was his first session with America and George Martin. Just like the last time, everything ran smoothly, and Hearts was completed on January 30th 1975. Less than two months later, Hearts was released on March 19th 1975. When critics heard the George Martin produced Hearts, it didn’t elicit the same response as Holiday. Although reviews of Hearts were mostly positive, they weren’t as gushing as Holiday. Still, though, Hearts received the seal of approval from most critics. They saw Hearts as a B+ rather than an A. Record buyers had a different view. When Hearts and the single were released on 19th March 1975, both proved a commercial success. Hearts reached number four on the US Billboard 200, and was certified gold. Sister Golden Hair reached number one in the US Billboard 100 and number five on the Adult Contemporary charts. It seemed the critics had been wrong. Nearly four months later, Daisy Jane was released on 2nd July 1975, reached number twenty in the US Billboard 100 and number four on the Adult Contemporary charts. Woman Tonight then reached number forty-four in the US Billboard 100 and number forty-one on the Adult Contemporary charts. Although these two singles were only minor hits, FM radio latched onto several album tracks. Old Virginia, Bell Tree and Midnight were regularly played by FM DJs. The America success story continued apace. Having released five studio album, and enjoyed eleven hit singles, Warner Bros. decided the time was right for America to release a Greatest Hits album. The release was scheduled for October 24th 1975. When the twelve compilation hit the shops, History: America’s Greatest Hits became America’s biggest selling album. It reached number three in the US Billboard 200 and number sixty in Britain. This resulted in the album being certified silver in Britain. However, History: America’s Greatest Hits sold four million copies in America, and was certified platinum four times over. In Australian, History: America’s Greatest Hits was certified platinum six times over. Over the border, Canada’s love affair with America’s music continued, and the album was certified platinum. There was no sign of America’s popularity declining. Far from it. So just three months after the release of History: America’s Greatest Hits, America began work on their sixth album. They had written thirteen new tracks for what would become Hideaway. Gerry Beckley had written four tracks, Dewey Bunnell five and Dan Peek three tracks. Jet Boy Blue, the other song on Hideaway was a Dan and Catherine Peek composition. These twelve tracks were recorded in Colorado. America and producer George Martin made the journey to Caribou Ranch, in Nederland, Colorado. It housed the studio built by James William Guercio in 1972. He had produced Chicago’s early albums. His other credits included sunshine pop group The Buckinghams and Blood, Sweat and Tears. However, one of James William Guercio’s finest hours was Blood, Sweat and Tears’ 1969 eponymous sophomore album. It won a Grammy Award. Seven years later, the thirty-one year old producer owned his own studio, and had been joined by America and George Martin. Recording began on February 16th 1976, and followed a similar pattern to Holiday and Hearts. America played most of the instruments, apart from bass and drums. So drummer and percussionist Willie Leacox and bassist David Dickey were brought onboard. By February 28th 1976, Hideaway was complete. Its release was scheduled for the 9th April 1976. That left less than two months to promote and release Hideaway. It wasn’t a lot of time, but wasn’t unusual in the seventies. Somehow, the record was mastered, the sleeve designed, promoted and copies sent out to critics. When critics received their copy of Hideaway, most of them gave the album positive reviews. Some critics felt Hideaway wasn’t America’s strongest album. They weren’t shy about saying so. However, the critics had been proved wrong before. Hearts was a case in point. So was Hideaway. It was released on 9th April 1976, and reached number eleven in the US Billboard 200. Having sold 500,000 copies, it was certified gold. This success continued when Today’s The Day was released on April 28th 1976. While it only reached number twenty-three on the US Billboard 100, it topped the Adult Contemporary charts. Four months later, She’s A Liar stalled at seventy-five in the US Billboard 100 and number seventeen in the Adult Contemporary charts. While this was a disappointing end to 1976, America were still a favourite of FM radio, with Jet Boy Blue and Don’t Let It Get You Down favourites of DJs. Commercially, 1976 had been a relatively good year for America. The only cloud on the horizon was that Hideaway had sold less copies than Hearts. It had sold less copies than Holiday. However, Holiday sold more copies of Hat Trick. As America headed out on tour that wasn’t the only thing worrying them. America were finding it hard to replicate George Martin’s arrangements live. So America decided to augment their live lineup. Percussionist Tom Walsh and keyboardist and saxophonist Jim Calire joined America on tour. Hopefully, their 1976 tour would improved sales of Hideaway. Although America’s 1976 tour proved reasonably successful, as the tour ended, still the sales of Hideaway were less than Hearts. This was disappointing. Little did America know that things were going to get a lot worse. From their 1971 eponymous debut, right through to 1976s Hideaway, it had been mostly smooth sailing for America. The only disappointment was Hat Trick. However, when George Martin was brought onboard, America never looked back. Commercial success and critical acclaim accompanied them. America had sold over 5.5 million albums in America alone since George Martin’s arrival. He had been a godsend for America. Without him, their career could’ve hit the buffers. He produced three consecutive gold albums. Could he make it four? America had been writing their seventh album Harbor, before heading to the Ka Lae Kiki Studios, Kauai, Hawaii. Just like their six previous studio albums, each member of America contributed tracks. Gerry Beckley penned five tracks, Dewey Bunnell three and Dan Peek four. With Harbor written, America made the short journey to Hawaii. Recording began in late 1977 at Ka Lae Kiki Studios. Harbor was the fourth America album George Martin had produced. They had all been certified gold. He was joined by some familiar faces. Drummer Willie Leacox and bassist David Dickey had played on previous America albums. Percussionist Tom Walsh had been part of America’s touring band. Larry Carlton, although an experienced musician, had never worked with America. He was a guitarist, but on Harbor, played electric sitar. This was new, and added an experimental sound. Maybe this should’ve been a warning of what was about to happen. Once Harbor was completed, Warner Bros. scheduled the release for 15th February 1977. Harbor, with its mixture of pop, rock and soft rock wasn’t well received by critics. They recognised that Harbor was easily, the worst album of America’s career. Despite the reviews of Harbor, when the album was released on 15th February 1977, it reached number twenty-one on the US Billboard 200. Sales were way down, and there was no gold disc for America. To make matters worse, the singles flopped. God of the Sun was chosen as the lead single. When it was released in April 1977, it failed to chart. Two months later, Don’t Cry Baby also failed to chart. Then later in 1977, Slow Down became America’s third consecutive single not to chart. By then, three had become two. Dan Peek had had a crisis of conscience. After years of enjoying the rock ’n’ roll lifestyle, Dan became a Christian. This was nothing new. He had been a Christian before finding fame and fortune with America. However, his faith had lapsed and Dan dabbled in drugs. Not any more. Now he had returned to the Christian fold, Dan was determined not to put temptation his way. So he left America. When Dan left America, it was with Dewey and Gerry’s blessing. However, this presented a problem for Dewey and Gerry. Did they remain a duo or recruit a new member of America. After some careful consideration, they decided to remain a duo. The first many people heard of the “new” America, was when they heard America Live. Just a couple of months after America were reduced to a duo, Gerry and Dewey journeyed to Los Angeles on July 24th 1977. Their destination was the Greek Theatre, where America were due to record a live album. For America Live, fourteen tracks were chosen. Seven were penned by Dewey Bunnell and six by Gerry Beckley. The other was Willis Alan Ramsey’s Muskrat Love. Accompanied by their touring band, the “new” America recorded their first live album. It would be released in October 1977. America Live wasn’t well received by critics. The loss of Dan Peek had proved costly. Now that America were a duo, gone were their trademark close vocal harmonies. While backing vocalists could try and make up for Dan’s loss, they didn’t come close. America weren’t the same band. Record buyers turned their back on America. America Live reached just a lowly 129 in the US Billboard 200. Even in Australia, where America were popular, America Live stalled at just seventy-four. America’s career was at a crossroads. 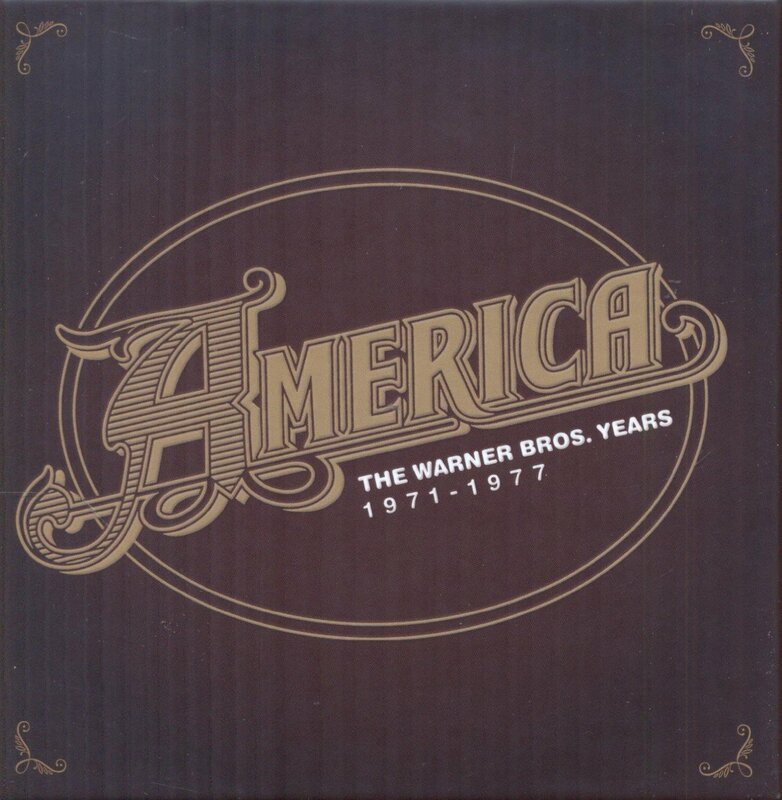 It’s America Live that brings The Warner Bros. Years 1971-1977 box set to a close. 1979s Silent Letter isn’t included. That’s no bad thing. Silent Letter was the last album produced by George Martin, It was recorded at AIR Studios, Montserrat during March and April of 1979. Over eleven tracks, America embraced disco and power ballads. It was a last gasp attempt to get their career back on track. Ultimately, this desperate throw of the dice failed. Critics were far from impressed by Silent Letter. They realised it was a far cry from America’s first two albums. 1971s America and its 1972 followup Homecoming, were the finest albums of America’s career. Silent Letter was the low point. As the reviews forecast, when Silent Letter was released on June 15th 1979, it reached a lowly 110 in the US Billboard 200. To make matters worse, the lead single Only Game in Town failed to chart. So did All My Life and All Around. However, All My Life reached forty-eight in the Adult Contemporary charts. Then in 1980, All Around reached forty-five in the Adult Contemporary charts. That was the end of America’s Warner Bros. years. The Warner Bros. years were the best years of America’s career. For much of that time, America’s albums were released to commercial success and critical acclaim. Their first seven studio albums sold over 4.5 million albums. That’s no surprise. During their time Warner Bros., America released the best music of their career. Their first seven studio albums and Live America are documented on America-The Warner Bros. Years 1971-1977. 1971s America begins the America story, and was the most successful album of America’s career. However, their 1972 sophomore album Homecoming is regarded by many as their finest hour. Unlike 1973s Hat Trick, which saw America’s career briefly derailed. It took producer George Martin to get America’s career back on track. From 1974s Holiday through 1975s Hearts to 1976s Hideaway, George Martin seemed to be working his magic. All seemed to be going well. Holiday, Hearts and Hideaway were all certified gold. However, Hearts sold less that Holiday. Then Hideaway sold less than Holiday. Executives at Warner Bros. looked on with concern. Then Harbor became America’s least successful album since 1973s Hat Trick. Just as things couldn’t get any worse, Dan Peek left. With America reduced to a duo, it was the end of an era. Their first live album, America Live failed commercially. That was a sign of what was to come from America. Fortunately, America only owed Warner Bros. one album. Silent Letter proved a disappointing end to a relationship that lasted eight studio albums, a live album and a greatest hits album. After over 8.5 million record sales, two platinum and three gold discs, America left Warner Bros. It had been an incredible journey that lasted eight years. Little did America realise when they left Warner Bros. and signed to Capitol, that they would never experience the same commercial success and critical acclaim. Incredibly, Gerry Beckley and Dewey Bunnell were only twenty-seven. They had their whole life in front of them. While they persevered with America for another four decades, America’s best years were behind them. They’re documented on The Warner Bros. Years 1971-1977, which is the perfect introduction to America. ← MILES DAVIS AT NEWPORT 1955-1975-THE BOOTLEG SERIES VOLUME 4.